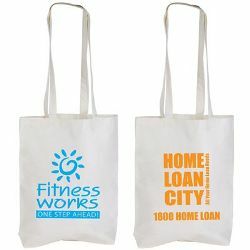 Promotional bags are commonly found at trade conference, trade shows or corporate events. Made from bamboo- a renewable resource and biodegradable, they are widely used for conventions, trade shows, fairs, sample bags, promoting environmental-friendly and eco-friendly messages and can be reusable as bags for shopping. They are available in styles, colors and patterns for your choice. Let your business and WA PRINTING give a hand to environmental revolution for reduction use of plastic bags! To make product inquiry, contact WA PRINTING stores in Perth and Midland now!